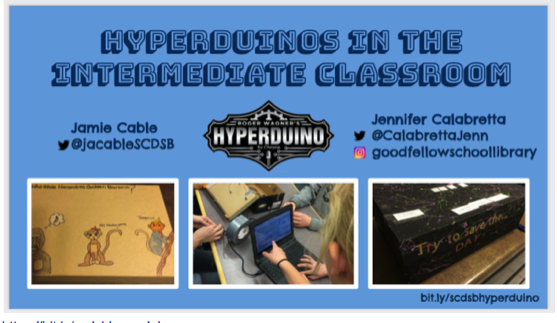 Below is a collection of example interactive maker projects created with the HyperDuino that have been posted on YouTube and Twitter. Turn any school diorama or posterboard project into an interactive learning experience with the HyperDuino. Use the HyperDuino touch sensors to light up LEDs in any model. HyperDuino projects support national and state standards including NGSS, CCSS and many others. Presentation Slides from Jamie Cable & Jennifer Calabretta, Bringing IT Together, Ontario, Canada.